Baltimore, MD, August 19, 2006: Intralytix, Inc. announced today that the Food and Drug Administration has approved LMP 102 for use on ready-to-eat food. LMP 102 is a bacteriophages based food safety product effective against Listeria monocytogenes. 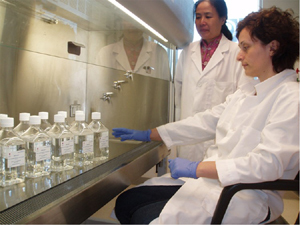 LMP 102 is the first and only bacteriophage-based product approved by FDA. Listeria monocytogenes is the deadliest foodborne pathogen found in ready to eat foods. "We are pleased with the approval by FDA of LMP 102. It is our intent to seek approval for additional food safety products effective against E. coli O157:H7 and Salmonella in the next 12 months" said John Vazzana, President and CEO of Intralytix. Intralytix (www.intralytix.com) is a biotechnology company focused on the development of bacteriophage-based products for the food safety, animal health and human health markets. Intralytix is one of the world's leading companies in phage technology. Its offices and laboratories are located in Baltimore, Maryland.